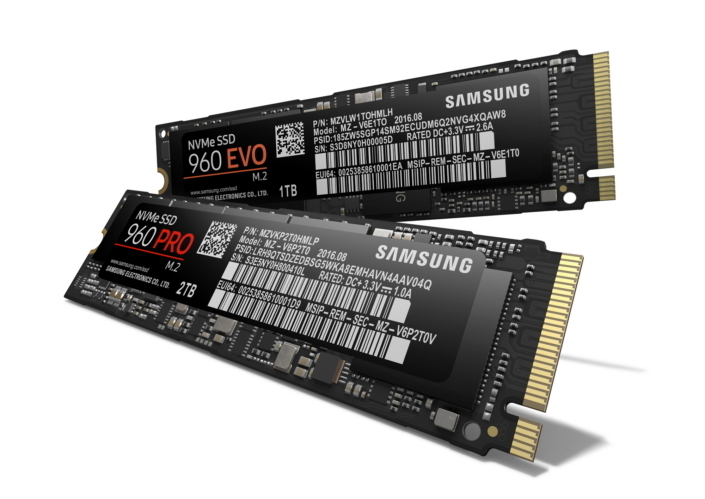 The 960 PRO and 960 EVO SSDs will be available worldwide starting October 2016, with manufacturer’s suggested retail prices starting at $329.99 and $129.99 USD respectively. For more information, including warranty details7, please visit www.samsungssd.com. 1,4,6 Sequential performance measurements based on CrystalDiskMark 5.0.2/IOmeter 1.1.0 and random performance measurements based on IOmeter 1.1.0.Performance may vary based on the SSD`s firmware version, system hardware and configuration. Test system configuration: Intel® Core i7-6700K CPU@4.0 GHz,DDR4 1700MHz 16GB,OS-Window 10 Pro x64,Chipset-ASROCK Z170 EXTREME 7. 2,3 1GB=1,000,000,000 bytes by IDEMA. A certain portion of capacity may be used for system file and maintenance use, so the actual capacity may differ from what is indicated on the product label. 5 Sequential Write performance measurements are based on Intelligent TurboWrite technology. The sequential write performances after Intelligent TurboWrite region are 300 MB/s(250GB),600 MB/s(500GB) and 1200 MB/s(1TB). 7 Samsung’s warranty does not cover any costs and expenses relating to SSDs’ overhaul/assembly and data recovery for repairs or replacements.